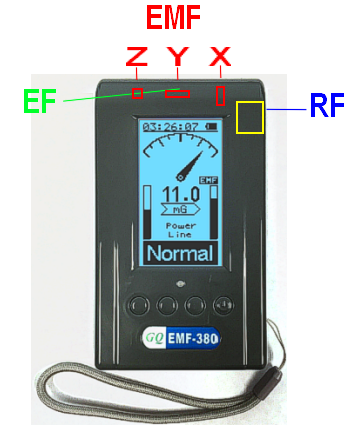 Exactly where are the sensors located in the EMF-380 so I know the best way to hold the unit for the best accuracy? Please describe the RF sensor. I assume that at low and mid frequencies it only picks up the electric field component normal to the face of the instrument and judging by the size I think it could be true for the highest frequency as well. Is this sensor used for all the ranges of the spectrum analyzer? The EF should pick up with same direction as the X, Y, and Z. However Y direction is preferable. There are different sensors for the spectrum analyzer.